These are the words I mumble as I sit here at the library, reading articles about Shirin Ebadi. I got the news relatively early in the morning last Friday, when a man I barely know (we are in a seminar together), approached me with a smile. “You must be proud,” he said. I found discussing this point with this Ivy-leaguer to be a mute point, so I cut the conversation short by saying, “It is great news,” and moved on. It was great news. But, a million questions kept crossing my mind about “Sh” the other nameless woman from Burma, the politics of the Noble Prize, and the “balancing” of “East” and “West”. I don&apos;t know how, but I knew who he was talking about. Who else would be the “representative” of all Muslim women, except for the only Muslim woman who teaches in this school? Aren&apos;t we “Orientals” all the same after all?! Smiling politely, I listened until the man, who astonishingly resembled framed pictures hanging on the walls of the school in which he teaches, decided to leave and let us get back to our meeting. That was just the beginning of the Shirin and the Kooseh tale. The coverage on Shirin Ebadi&apos;s Noble Peace Prize has been amazing, to say the least. To begin with, the Noble Committee statement itself demands deliberation. In their statement, the Norwegian Nobel Committee lets us know that Ebadi is “a woman who is part of the Moslem world, and of whom that world can be proud,” thereby marking and highlighting her difference as 1. a woman 2. one who belongs to a whole “other world”. Paradoxically, this statement simultaneously flattens all other difference in “that part of the world” under a single signifier: Islam. So, those aliens (isn&apos;t this what people from another world called?) are all supposed to feel the sense of pride that comes with having a representative among the “noble”. The committee does not hesitate to remind us that “no society deserves to be labeled civilized unless the rights of women and children are respected.” Thus, by deploying the plight for women and children and through making them markers of civilization and freedom, the committee exercises its authority of measure and “label” the degree of civilization, by reifying the difference between the “civilized” and the “barbaric”. Thus, the donor of the prize, the Norwegian committee, assumes a temporal lag in the “Moslem world and all the countries” that need a push to get to the time of “progress” where some “countries” have supposedly achieved respect for “rights of women and children!” The task of the Nobel Committee, we are told, is to “to speed up this process”. Another form of representation is Sajjadi&apos;s reformist critique, which seems to be inclined towards the logic of “Westoxification” or “Occidentosis” [Taba&apos;aat-e Nobel]. Sajjadi pathologizes Iranians who celebrate this event, and claims that Iranians who suffer from an inferiority complex (khod kam beenee) and narcissism (kheesh kamehgee) use this event as a ruse for their “lack”. As such, Sajjadi reconsolidates Orientalist assumptions, where “jahaan-i peeramoon” (by which I assume he means the “West”), possesses the phallus that Iranians who are celebrate Ebadi&apos;s achievement “lack”, but desire! It is with this phallogocentrism that Sajjadi deploys a wrestling metaphor in claiming that Ebadi has been elevated from medium weight (“neemeh sangeen”) to ultra heavy weight (“fowq-i sangeen”). This critique is not to dismiss every point that Sajjadi&apos;s argument raises, for I agree with him that mindless celebrations overlook transnational relations of power. However, I think Sajjadi repeats what he criticizes by using Orientalist tropes and by assuming dichotomies such as “Western civilization”, (Tamaddon-i qarb) and the “Muslim world” (jahaan-i Islam) to be natural categories that are mutually exclusive. With the amount of resentment that Sajjadi expresses over Hashim Aghajeri&apos;s “defeat”, I wonder how much of his argument is based on a kind of sexism that dismisses any form of feminist practice and politics, by deeming it as less important than other areas of reform and politics (so called “real politics”). His logic puts Ebadi between a rock and a hard place, where she has no choice but to choose between Islamic reformism and secularism. Any position of liminality is halted and perceived as being prone to “contamination”. And then there is Hossein Noushazar&apos;s attempt to “feminize” Ebadi&apos;s return to Iran! [Esteghbaal az Ebadi] Noushazar&apos;s recourse to Pre-Islamic traditions utilizes myth-history to revive an immemorial past upon the body of the Iranian woman. This pseudo-feminist article turns the “Iranian woman” into the site of contestation of people and the state (“mardom va hokoumat”). Noushazar praises women who wore white hijab and held white flowers at the airport, and claims that their gesture signified both peace and womanhood! (“ham payaam aavar-i solh bood, ham az zanaanegi-ye een a&apos;een nishan daasht”). Heterosexual fantasies of domesticating the pure Iranian virgin woman are embodied in the image of the woman-in-white who greets Ebadi, and Ebadi herself, who becomes “the bride of the metropolis” (aroos-i shahr). Not surprisingly, Noushazar&apos;s atavistic woman is the keeper of the tradition (of Pre-Islamic kind) and historically continuous with Mitra. Being robbed of her agency, the Iranian woman is fetishized as the object that decorates the masculinized city. Within Noushazar&apos;s configuration, Ebadi&apos;s work is only intelligible as far as it is conceptualized within the heterosexual hegemony, and Iranian women&apos;s activism is reduced to their adherence to modesty and virginity! Now you see why I mumble “Har kee beh fekr-i kheesheh / kooseh beh fekr-i reesheh”? I have not gone crazy. I have good reasons to sit at the library, look at the computer, and talk to myself! I just hope that in the midst of all this insanity, Shirin Ebadi continues her important work, despite the fact that her work is being appropriated by sharks of all sizes who are running after her in quest of a beard! 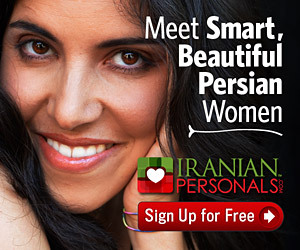 Well, I am confident that she will, as she and many Iranian women have found their ways around all the kaasehs, koozehs and koosehs that appear on their ways.